Ahh…the beginning of summer is here! Memorial Day is a day of celebration with family and friends…and what better item to be on the menu than a big beefy Portobello Angus Burger! 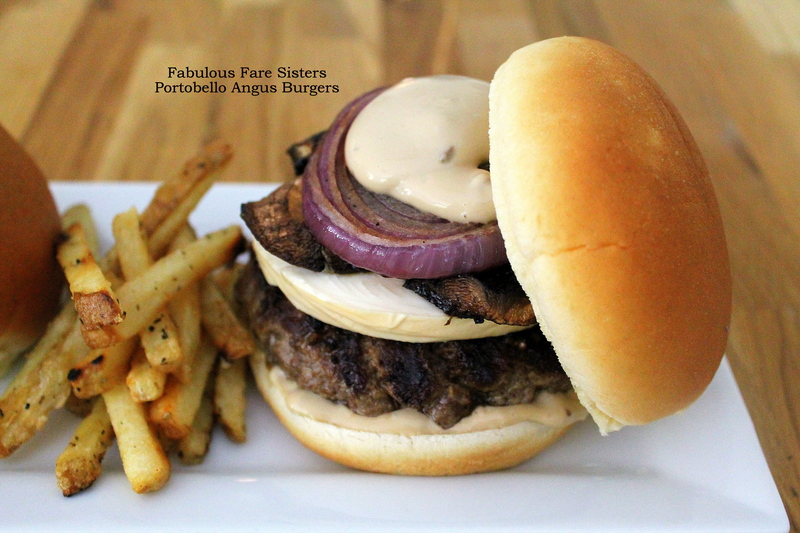 These burgers have everything….Angus beef, fresh portobello mushrooms and thick slices of red onion roasted to perfection…smoked mozzarella cheese and a dollop or two of balsamic-mayo sauce. Delicious! This recipe makes 2 big Portobello Angus Burgers. Heat oven to 450 F. Cut the mushrooms and the red onion into thick slices. Make the Balsamic Vinaigrette (recipe below) and slather a tablespoon or two onto both sides of the mushroom and onion slices. Place on a baking sheet and bake in the oven 10-15 minutes until nicely roasted. Season the ground Angus beef with the steak seasoning, garlic powder and salt. Form into two large patties. Cook 3-5 minutes on each side either on the grill or in a grill pan. Top with the slices of Smoked Mozzarella. In a glass measuring container, whisk the balsamic vinegar, brown sugar, minced garlic, salt & pepper until combined. Slowly whisk in the olive oil. To make the Balsamic-Mayo Sauce: whisk the mayonnaise with two tablespoons Balsamic Vinaigrette. To serve: Slather the bottom of the Potato Rolls with some Balsamic-Mayo Sauce. 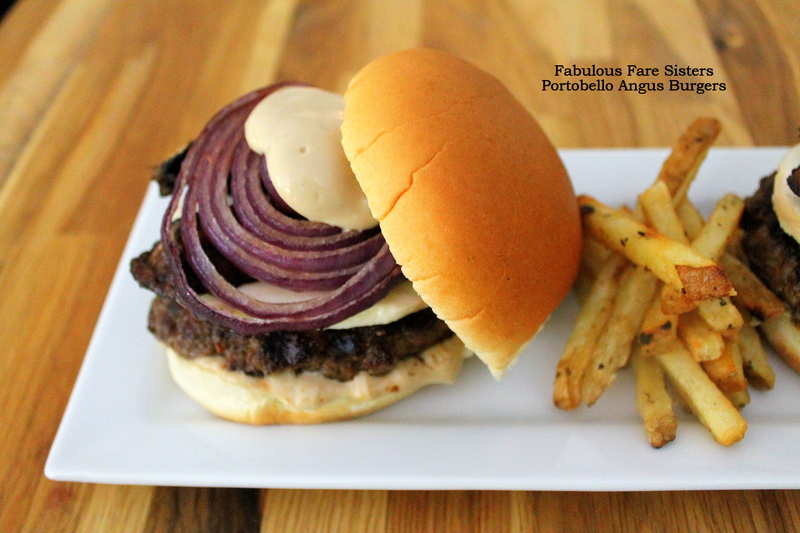 Layer with Angus Burgers & Smoked Mozzarella, roasted portobello mushroom and red onion slices and another dollop or two of Balsamic-Mayo Sauce. Serve with a side of french fries. This recipe has been shared on Inspiration Thursday, Throwback Thursday, Senior Salon, The Pin Junkie, Fiesta Friday, Freedom Fridays, Funtastic Friday and Foodie FriDIY, along with Weekend Potluck and Saucy Saturdays … Go check it out and see some other great sites! What a great double up with the portobello. Thanks for sharing with us at Throwback Thursday! Pinned and shared. Love portobello mushrooms! Will have to try this recipe. Thanks for linking up with Funtastic Friday. I love everything about this. One it’s a burger and has mushrooms, my fave. I’ve never seen mayo with balsamic and it sounds wonderful! Every part of this recipe is excellent! I think I have to have these in my life! Pinned – and thanks for sharing on FF!! I love a good burger and this looks amazing Linda! I hope you had a nice Memorial Day! You make everything look fabulous! Looks so succulent; the beef. Love the plate and the presentation! sounds delicious and looks like one of the most appetizing burgers i have seen in a while!!! Wow. The burgers look amazing. Definitely a recipe to keep and cook this summer.